Today constituents of SNP MSPs began to received responses to the emails they sent asking them to vote for James Kelly’s repeal bill. The responses we have seen indicate a complete contempt for their constituents and for Scottish society in general. Every single one is based on arguments which have been put forward and rebutted several times over in the course of the past six year. They have even been reduced to quoting a discredited Scottish Government-funded womens’ organisation who lied to the Justice Committee about the nature of their evidence. However, in order to be helpful to those receiving the letters, we will dig out all the responses we have given over the years and provide them in FAQ format on this site over the next few days. It is a sad day when elected members have so little respect for the people they represent that they cannot be bothered to actually respond to their concerns. To send out such embarrassing drivel is disprespectful to the recipients but it also highlights the paucity of any real case for retaining the Offensive Behaviour Act. If they had any real arguments at all, they certainly wouldn’t be relying on these ones. Author FACPosted on October 31, 2016 October 31, 2016 Categories FACTags FAC, Offensive Behaviour Act, repeal, scrap the football actLeave a comment on FAC Statement #AxeTheAct Consultation. 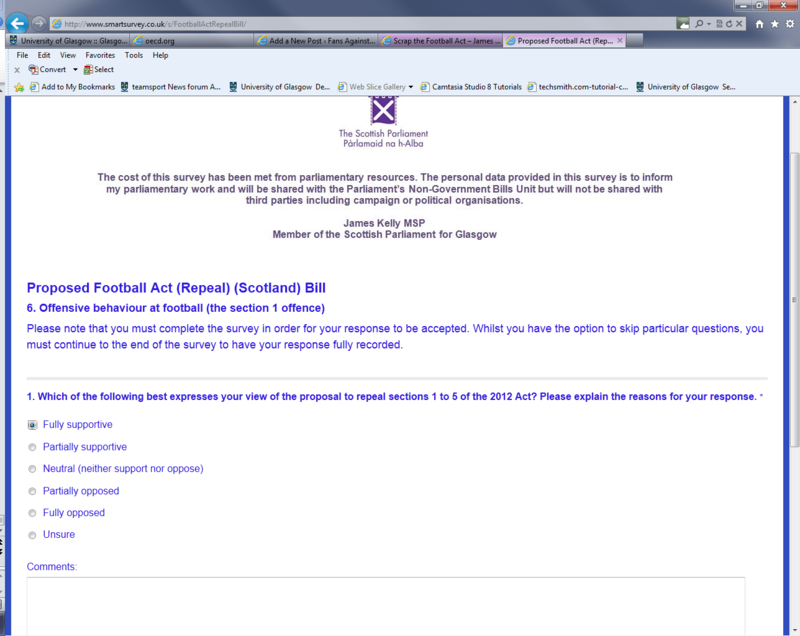 Author facPosted on October 4, 2016 October 19, 2016 Categories FAC, HolyroodTags Offensive Behaviour Act, repeal, scrap the football act2 Comments on Your submission counts! FAC Open Meeting – fans of all clubs welcome. Author facPosted on September 23, 2016 September 28, 2016 Categories FACTags 3rd October, FAC, public meetingLeave a comment on FAC Open Meeting – fans of all clubs welcome. See how long you have left to play your part in repealing the Offensive Behaviour Act! Author facPosted on September 16, 2016 Categories FACTags consultation, FAC, Offensive Behaviour Act, public, repeal, scrap the football actLeave a comment on See how long you have left to play your part in repealing the Offensive Behaviour Act! 15/08/16 Day 15 of the consultation: please ensure you press the SUBMIT button! Author facPosted on September 16, 2016 Categories FACTags consultation, FAC, Offensive Behaviour Act, public, repeal, scrap the football actLeave a comment on 15/08/16 Day 15 of the consultation: please ensure you press the SUBMIT button!